Today I thought I would play along with the Merry Monday #37 challenge and give you a break from Halloween (wink-wink). So, get out your Christmas stamps & paper and play along this week. There's some amazing inspiration from their talented designers that you won't want to miss and there's only 69 days until Christmas. I was just perusing cards for ideas for this challenge and yours caught my eye. I really like this card, it's so vibrant and there is a lot going on without seeming busy. Gives me some ideas! I love that ribbon banner! This is such a classy card, Beth! Thanks for sharing it with us at Merry Monday! So very pretty...I might just have to get some of this paper! 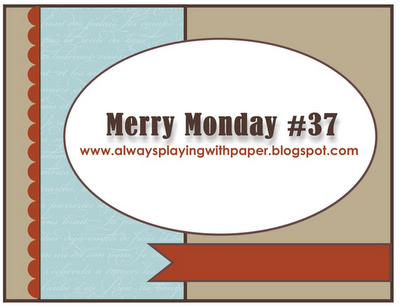 Thanks for playing with the Merry Monday sketch with us this week!